I sat last night in the studio wanting to paint - but being fatigued I sat listening to silent brushes, unopened tubes of paint and flat unmoving paper. I finally reached for a map from recent travel. Have you heard of that theory the only way to fold a map is the wrong way. Well I considered that and then I went to making boxes which I often do when working with people. With the very creased and used map it was a little trick to fold. I wanted sharp crisp lines. I loved the total contrast, the smooth lines of a random crunched up ball of paper. While turning and looking it presented areas of intrigue. the contrast of print, folds, light and dark. Further observation, sitting with the object. Processing. There is no depth of field with the i-phone camera app - the shoots were a simple record. 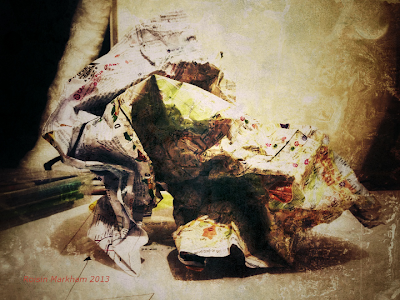 I think the paper playful exploration might be worth a longer study and a decent camera. The making of something 3D with my hands translated into images through lens based work is a reflection of process. 2D - 3D - 2D negative positive space moving between structure and composition. the promise was subconscious but I expected something concrete. The issue was how fast was the creative enquiry delivering? On typing now I am reminded about the Visual Theatre Workshop last year and when painting was too flat. And so what of it? I pulled the paper it ripped a little, I wanted it to stand... did it look like something? Did I care? After all its just some paper play. The map is no accident either the paper playfulness is a way to prototype thought, action and further exploring the 'texture of my map'.